Over the past few weeks the Sun has been unleashing a huge number of particles toward the Earth and no doubt in the far north and south (clear skies permitting) they are putting on quite a show. This is a story of the journey from the Sun to the night sky and our eyes. The journey starts at the heart of our star, where it is an unimaginable 15 million °C and 150,000kg of matter is packed into each cubic metre; that is as if 30 African elephants occupied a 1 meter cubed box. The particles at the heart of our Sun are Hydrogen nuclei; these particles collide together with enough force to combine through nuclear fusion to produce Helium. This process converts a small amount of mass into a large amount of energy, via the famous equation E=mc2. Every second the Sun converts around 4.3 thousand million kg of matter into pure energy. This energy is radiated out, in the form of photons, 70% of the way through the Sun in a process which takes tens to hundreds of thousands of years. The final 30% of the journey to the sun’s surface is through a process of convection where the hot plasma rises to the surface as cool plasma descends down. The ‘surface’ of the sun is covered in convective cells up to 600 miles across making it look grainy. The temperature at the surface is only 5,500 °C and the density has dropped to 0.001 kg per cubic meter. The Sun’s surface is dominated by a host of different activities from dark sunspots to bright faculae. The most violent events that occur on the sun’s surface are where the journey of our particles continues. A coronal mass ejection, or CME, is one of the most explosive events on the Sun where up to 1013kg (that is 10,000,000,000,000 kg) of solar plasma breaks away from the surface at speeds between 100 and 2,000 km/s. These particles form a dense loop of plasma that moves away from the Sun with each particle aligned to the magnetic field of the Sun. On occasion these CMEs cane be directed towards the Earth and take between 17 days to 20 hours to travel just under 150,000,000 km to reach the Earth. The Earth itself is surrounded by a magnetic field, which can be compared to that of a bar magnet, where lines of force flow out from the south magnetic pole and loop inwards at the north magnetic pole. The magnetic field of the particles in the CME loop (aligned to the suns magnetic field at time of release) interact with the magnetic field of the Earth. If these two magnetic fields are in opposition, one pointing upwards and the other pointing downwards, a strong interaction will occur creating a reconnection point (where the magnetic fields join together). 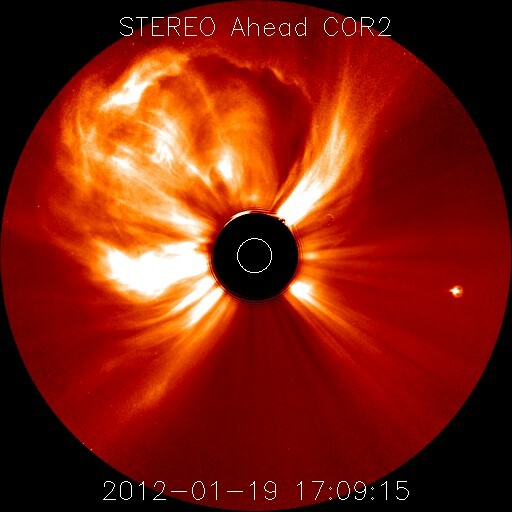 At this point the particles in the loop of the CME flow along the field toward the poles. The continuous pressure from the solar wind pushes the field carrying the particles around the Earth to a region where the magnetic field is stretched out away from the Sun. The pressure increases and pushes the field lines from the north and the south together in the tail where the fields once again reconnect channelling particles towards the poles. It is this inflow of particles to the poles which generates the aurora as they collide with the atmosphere. 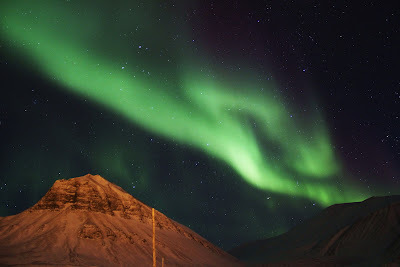 The particles have been accelerated by magnetic reconnection along the Earth’s magnetic field to the upper atmosphere at the poles, when these particles collide with the atmosphere they produce photons that we then see as the aurora. The aurora is often viewed as a green illumination of the sky, which is a result of the particles interacting with Oxygen. This process also produces Red light, however, this occurs higher up in the atmosphere where there is less oxygen and collisions less frequent allowing the time for the reaction to take place. The process where green light is produced is over 100 times faster than that for red light so is more widely seen (our eyes are also more sensitive to green light). It is also possible to get Blue aurora which is when the solar particles interact with nitrogen in the atmosphere this is at even greater altitudes than that of the Red aurora and the transition between green to red to blue can produce a beautiful array of colors in the night sky. The light we see from the aurora is a beautiful consequence of a monumental journey from the heart of our Sun, to a huge explosion on its surface that sends it hurling through space interacting with any object in its path. These events can cause some serious ramifications, but they also have the benefit of displaying their beauty, something which I was lucky enough to experience last year when this picture was taken. For more information on space weather check out the NOAA Space Weather Prediction Center website. you're really a just right webmaster. The website loading speed is amazing. It seems that you're doing any unique trick. In addition, The contents are masterwork. you've performed a great job in this subject!